would y straps have been used? what weapons would they have carried? would the K98 have been used? How many mag pouches would they carry? which side should the pistol be on? I currently use my K98 as this is all i have for now, with a single tripple mag pouch over my left hip and my holster on my right, I also just recently got some y straps as I was orrigionally doing fallshirmjager, do I still need these for an fg impression, if not they may go up for sale. That word doesnt exist - please stop using it!! The one that didnt exist until people started playing airsoft. Well as far as i am aware its a term currently used by military forces, and I couldnt think of another word to describe what i was asking about, does it realy matter that much if I use such a word, its just a question. the main differance with FGs is they are more smartly turned out - so as to set the example - and they generally hang on to marching boots / early tunics / kragenbinde. Collar fastened, clean kit etc. K98 is fine - not sure of the percentage issue of pistols ? I think people tend to asuume that they all have MP40s - but K98 would be much more common. Y-straps - i would think is dependant on how much kit weight you have on. and what time period ? yes - that word is bloody anoying!! well apart from the boots (using mock jump boots as i am doing fallsjirmjager fg) I seem to have the right look then, thanks, will hang on to my y-straps for now then, just in case, just need to get some warmer field gear clothing, trops aint fun in winter. AH - I thought you meant you were swapping from Falshie to Heer FG. But you meant from Falshie Infantry to Falshie FG ? Still think your set up sounds fine - but I'm sure there'll be someone more versed in such things, along shortly. 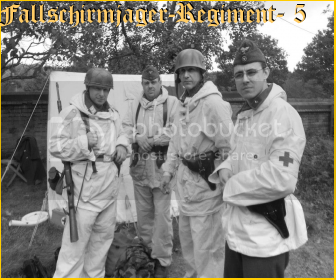 ye, sorry, I figured from my previos posts, people would know i do Fallshirmjager, (get shouted at when i use fallshie), also on that note for kit, would FJ FG use Luftwaffe Feild Unit or army cammo, want to know if I can use the army splinter smocks etcc in the summer months. Any cammo worn would be Luftwaffe cammo. Though - being FG - they probably wear it a lot less often than their infantry counterpart. ok will stick to my smock and a winter smock once i get one, I know fallshirmjager use them. If You mean the winter padded suit - then yes you can use army cammo - get the pants as well - it should be worn as a suit - rather than just the jacket. It's a common mistake (we've all done it) to wear just the top - it's very rare to see the top worn without the bottom. Also - (army wise at leest) padded suits are mostly an eastern front thing - they are designed for a cold/cold environmet rather than a cold/wet environmet. greatcoats keep out rain better and dry quicker - so even winter 44-45 it's greatcoats on the western front. Not an expression used when I was in the army, possibly the American military, defiantly an air softerism.